Karen spent 30+ years as a Civil Servant, mostly in Revenue which is where she developed my absolute hatred of poor writing skills! Her favourite genre is now crime/thriller/police procedural/legal genre with the occasional foray into chick-lit and general fiction. 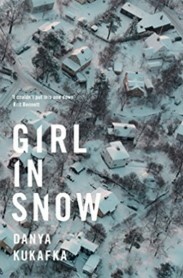 When popular teenage girl Lucinda Hayes is murdered and her body left in the snow, the repercussions echo like the peel of a bell in a sleepy suburb of Denver Colorado, but the impact will be felt by three specific people most lucidly. Though a debut, it is written in such an assured style that it had this reader pondering if it was in fact written by an established writer, working under an alias. Though marketed as a thriller, it is actually a character driven study of allegiances, friendships and the secrets that are often hidden between people when the line between love becomes obsession, and where truth and lies are intertwined so that delusion and reality can be interchanged due to circumstance, context and the vagaries of memory and motive. So we have misfit Cameron Whitely who loved Lucinda, as his sketch-book attests. We also have Jade who longed for Lucinda’s seemingly perfect life (a far cry from her own chaotic existence), and we have Russ Fletcher the small-town cop assigned to investigate Lucinda’s murder, and one who has shadows clouding his own past. It seems that Cameron’s absent Father Lee was a former cop, and a partner to Russ Fletcher too boot. Though there are other avenues and motives to explore, such as the school janitor and rumours of a Stalker. The pacing of the narrative is slow, and at times glacially so, but the quality of writing and characterisations so vivid, and assured that readers may forgive the author, savouring the deployment of language as the tale unfurls.